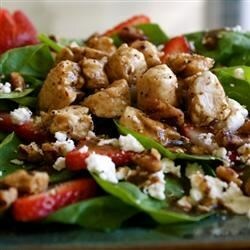 Place the chicken breast meat into a skillet with 2 tablespoons of Vines & Branches Organic Basil Olive Oil & 2 tablespoons of Vines & Branches Strawberry Balsamic. Cook over medium heat. Stir until chicken is browned, no longer pink in center, and juice has nearly evaporated.